LifeGivingForce have had a very busy few months. 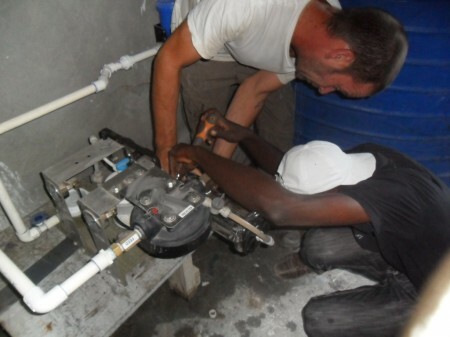 Here is a photo of our clean water system being installed at the Partners in Health hospital in Petite Riviere. The PIH team are very grateful for the new system. It is being put to good use in this very busy hospital. Thanks to our partners, UN CVR section for helping make this happen. This entry was posted in LifeGivingForce Foundation, Partners, Stories and tagged clean, clean technology, Clean water as Human Right, Haiti, LifeGivingForce, Partners in Health. Bookmark the permalink. Post a comment or leave a trackback: Trackback URL.